How Many Calories Burned in a 10K Cycle? A 10-kilometer cycle can burn more than a few calories. Since counting calories without specialized equipment is an inexact art at best, your exact caloric burn will vary according to a wide array of factors. However, a "typical" baseline can be of help with your weight loss and exercise planning. Calories are a measure of energy. In physics, a calorie represents the amount of energy it takes to raise the temperature of 1 g of liquid water 1 degree centigrade. However, when nutritionists say the word "calorie," they actually mean 1,000 of those calories. It takes 3,500 calories -- by nutritionist standards -- to equal a pound of fat. 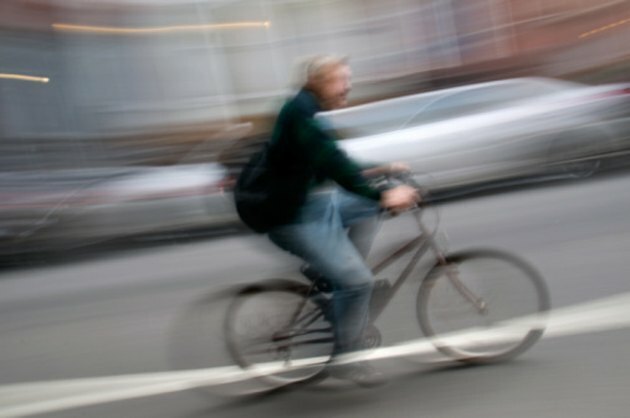 How many calories you burn riding a bicycle depends on how heavy you are and how fast you ride. At 15 miles per hour -- a four-minute mile -- a 160-lb. cyclist burns about 300 calories in a 10K ride. Although riding a bicycle mitigates the effect of weight, heavier people will burn more calories in the same workout and lighter people will burn fewer. For example, a 200-lb. cyclist riding that distance at that speed would burn about 60 calories. Your actual results on a 10K bike ride will vary widely from that "typical" average. For example, slope and gear selection -- as well as the quality of your cycle and tires -- can all make the ride easier or more difficult. Other factors that can increase or decrease your burn include the air temperature, your hydration level and even your mood during the ride. A 10-kilometer bike ride is no easy feat. It will cause microscopic tears in your leg muscles and deplete your body's stores of hormones and chemicals used during the ride. For several hours after you dismount, your body will be replenishing those supplies and repairing that damage. During that time, you will be burning more calories than normal in all activities you undertake. How Many Calories Burned on Elliptical or Bike? Do You Burn More Calories Jogging or Rollerblading? How Many Calories Can You Burn in an Aquafit Class? How Much Weight Does a Person Lose After Running a Marathon? How Many Calories Does One KCAL Equal?